If you feel you’re long overdue to hear the whispered words “come up to my room” by stylish stranger then do yourself a favour and head to the Gladstone Hotel this weekend where you are certain to get lucky. Take a short trip up the historic hotels wooden staircase and immerse yourself in art that was designed to engage your senses, memories and perceptions of reality. For the last 13 years the Gladstone has hosted one of Toronto’s most important art and design shows, Come Up To My Room. Artists from across Canada and abroad treat Torontonians to some of their best work by dramatically transforming each room on three of the hotels floors. The vibe is super festive, especially in the evenings where artists and their admirers are just as interesting as the art itself. With the Toronto Design Offsite Festival and Interior Design Show in full swing, Come Up To My Room stands out as a playful climax to a week filled with design events that have Toronto buzzing for pretty little things. With a glass of vino in one hand and my camera in the other I skipped through a series of fantastical worlds which have turned one of Toronto’s much loved boutique hotels into a series of magical moments. 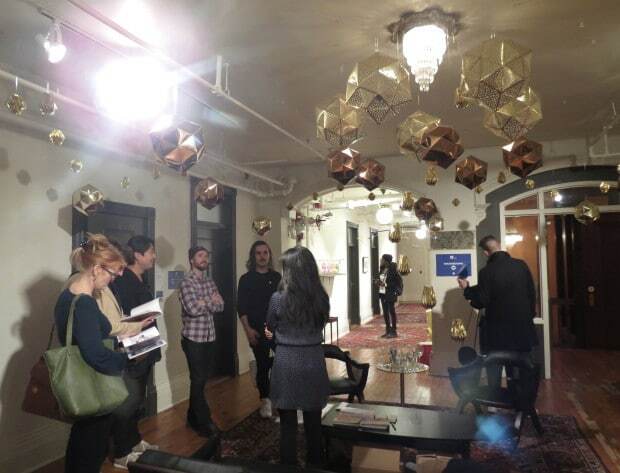 1) Untitled (Idolization Space) by Sara Nickelson & Studio WOOLF; Toronto, Canada. This modern day chapel hosts classical style paintings of visual clutter from our internet searches and an alter full of white iPhones that reflect back to us our own techno-lust. This room is refreshingly serene, and quite beautiful to be in. 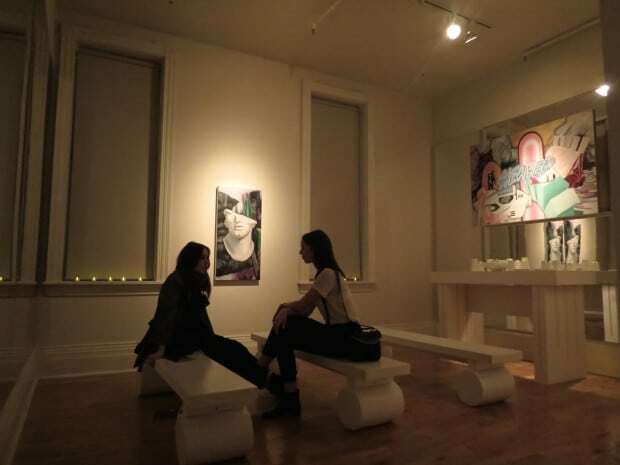 2) Gallery Youn by Christine Kim; Toronto, Canada. Metallic paper sculptures encircle the room in arches of reflected light to create a mesmerizing effect. Upon close inspection of the of the work it becomes quite clear that only a very talented artist could have finely crafted these dangling gems. 3) Overworld by Taxa Work: John Taylor Bachman, Can Vu Bui, Vincent Calabro, Lane Rick, Katie Stranix; New York /Chicago/Shanghai. 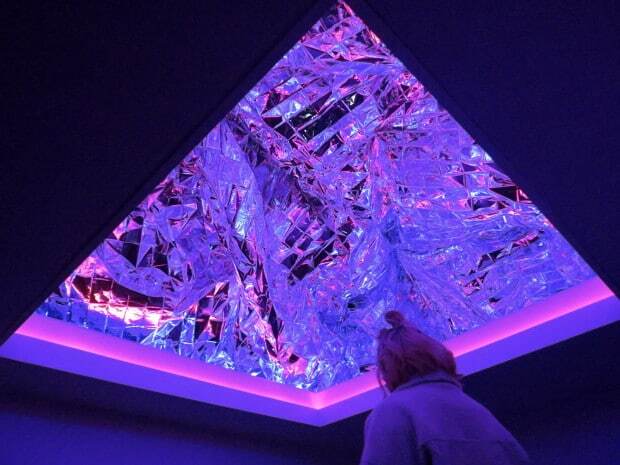 This minimal and atmospheric room is one of the most visually striking in the show and offers a psychedelic hotline bling-esque chill out space for cosmic thoughts and picture perfect selfies. 4) Equivalents by Susan Dobson and Simone Ferkule; Guelph/Toronto. 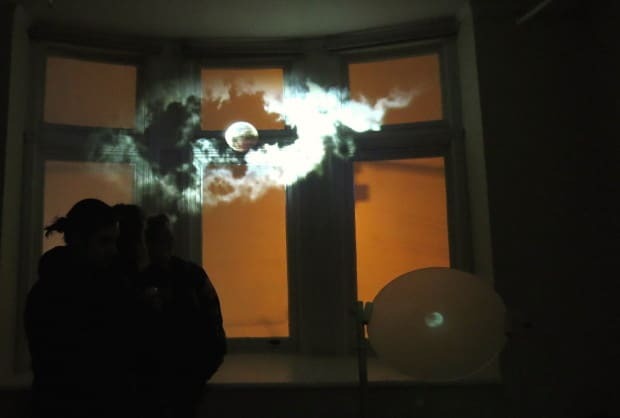 This gorgeous installation embraces the viewers with projections of many moons among drifts of clouds to a perfect soundtrack of ambient noises. It really feels as though you are standing outside in the far north watching the night sky. 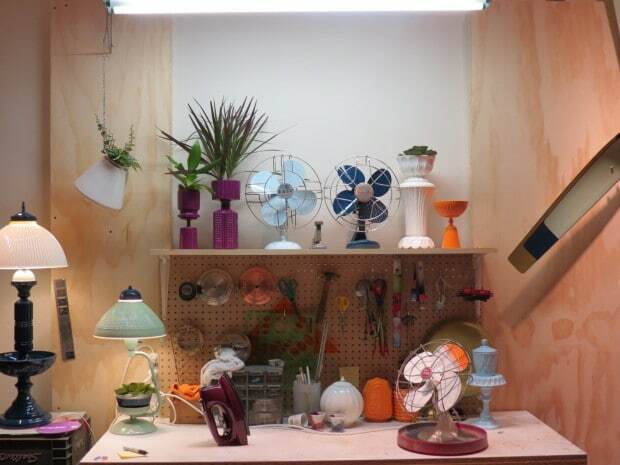 5) Reimagining the old by Carl+Rose: Suzanne Carlsen, Noah Rosen; Toronto. These fresh and functional pieces carry a big design punch and get environmental brownie points for inventively reimagining “old stuff” as new and desirable once again. A near perfect balance of art and design. Come Up To My Room runs Jan 21-24th at the Gladstone Hotel (1214 Queen Street West). Admission is $10.